Transient Ischaemic Attack (TIA) and stroke are clinical syndromes characterised by acute neurological deficits with vascular causes. 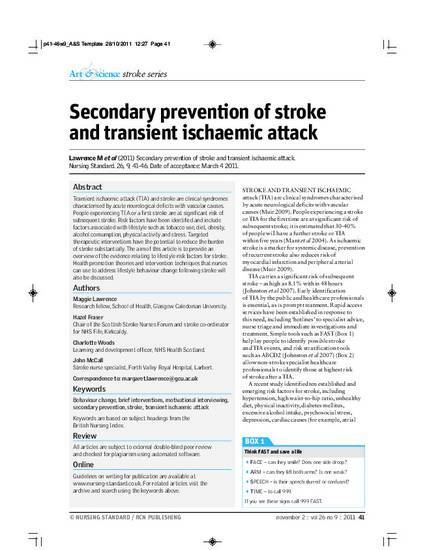 People experiencing TIA or first stroke are at significant risk of subsequent stroke. Risk factors, which are associated with 90% of risk of all stroke, have been identified, and include factors associated with lifestyle i.e. tobacco use, diet, obesity, alcohol consumption, physical activity and stress. Targeted therapeutic interventions have the potential to substantially reduce the burden of stroke. The aim of this article is to provide an overview of the current evidence base relating to these lifestyle risk factors. Health promotion theories and intervention techniques that nurses can use to address lifestyle behaviour change following stroke will also be discussed.